We demonstrate the usefulness of surroundedness for eye fixation prediction by proposing a Boolean Map based Saliency model (BMS). In our formulation, an image is characterized by a set of binary images, which are generated by randomly thresholding the image's feature maps in a whitened feature space. 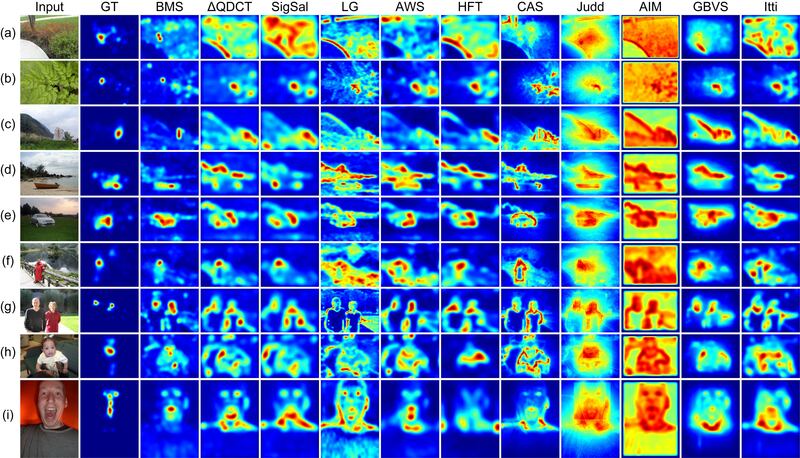 Based on a Gestalt principle of figure-ground segregation, BMS computes a saliency map by discovering surrounded regions via topological analysis of Boolean maps. The strength of BMS is verified by its simplicity, efficiency and superior performance compared with ten state-of-the-art methods on seven eye tracking benchmark datasets. The green line presents the improved version of BMS described in , and the red dashed line represents the previous version described in . We re-evaluated all the methods in  using the updated implementaion of Shuffled-AUC (provided below). We also tuned the compared methods for better performance. Note that the Judd's model uses object detectors, which were disabled in the evaluation of , but in  the scores of the full implementation of Judd's model are reported. All these changes account for the differences between the scores reported in  and in . We provide two versions of code. They have been tested on Windows system, with Matlab 2011+ and OpenCV2.40+. They are essentially the same but need to be compiled differently (detailed instructions included). Usually, either of them should work on your computers, but the EXE version can run without Matlab. This implementation of BMS is only for eye fixation prediction. It is more accurate and faster than the previous version. Under the default configuration, it runs at about 11fps. It can be configured to run at about 100fps with only a slight drop in performance. We provide an improved implementation of shuffle-AUC. We also provide the postprocess code if you are interested in evaluating our method in any metric that does not control center bias. e.g. AUC, Similarity.